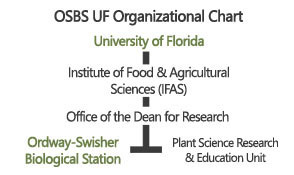 The Ordway-Swisher Biological Station (OSBS) is a University of Florida research support facility established for the long-term study and conservation of unique ecosystems through management, research, and education. OSBS currently comprises over 9,500+ acres with building facilities to support research, education, and conservation efforts. The Station is administered through the UF Institute of Food & Agricultural Science's (IFAS) Office of the Dean for Research and is located approximately 20 miles east of Gainesville in Melrose (Putnam County, Florida) - roughly north latitude 29°41' and west longitude 82°. Due to the sensitivity of the work conducted on-site, the facility is not open to the public except for arranged tours and events. OSBS is a member of the Organization of Biological Field Stations (OBFS). What is a Biological Station? Field stations serve a number of critical scientific functions. They give researchers reliable access to the environment. They accumulate and integrate multidisciplinary, place-based knowledge that provides a baseline from which to evaluate environmental change and predict how biological systems may respond to it in the future. They also transform the lives of students of all ages and serve as training grounds for the next generation of scientific leaders. Finally, they are on the front lines of integrating science into decision-making and of communicating science to the general public. – An extract from Field Stations and Marine Laboratories of the Future: A Strategic Vision written by the Organization of Biological Field Stations. To help facilitate research by academia, governmental agencies, non-governmental organizations (NGOs), and the private sector on biotic and abotic processes in ecology and conservation. To serve as a teaching and training platform for students of all ages to gain hands-on experience in research processes, Florida’s natural history, resource management, and conservation. To manage the Station’s natural resources in order to enhance its conservation value and to provide research and educational opportunities.